When the Redskins announced that Joe Barry was going to be the defensive coordinator for the upcoming 2015 season, I wrote a defensive breakdown of his 3-4 Under with the San Diego Chargers and how it might be applied to the Redskins defense. As of writing this piece, over half of the season has been played and I have had sufficient time to analyze the Redskins’ defensive tendencies and situational play of their favorite formations. In this article, we will take a closer look at how the Redskins use that 3-4 Under defense, but how they also use the 4-2-5 Over as a base against the 11-personnel groupings using three wide receivers. As a rule of thumb, even-technique players (and the 0-technique) line up directly opposite their opposing blocker, while odd-technique players line up on the outside shoulder of the opposing lineman. The only exception is the 7-technique and you can blame legendary coach Paul “Bear” Bryant for that, but I digress. As a recap to my previous article, the Redskins use the 3-4 Under as their base defense. This defense consists of three defensive linemen. The nose-tackle lines up in the strongside 1-tech position, while the two defensive ends line up in the strongside 5-tech, and the weakside 2i/3-tech position, respectively. The weakside 2i/3-tech position is the only two-gap player on the defensive front, while the 5-tech defensive end position is the primary pass rusher on the defensive line. When the Texans ran this defense under Wade Phillips, this position was occupied by all-pro defensive lineman J.J. Watt, while the Redskins use veteran Jason Hatcher. Obviously Watt is far superior to Hatcher, Hatcher actually is a good fit for the position although he is getting older and will need to be replaced soon in the next draft. Nose tackle #98 Terrance Knighton, in the strongside 1-tech position, swim moves the center and chases the running back on his toss outside. He also serves as a cutback defender if the running back decides to work his way back up either A-gap. Defensive end #92 Chris Baker, in the weakside 3-tech position, controls the right guard and does not allow him to gain any leverage as the offensive line flows to their right (our left on the GFY). Inside linebacker #56 Perry Riley flows outside of the run, and to a casual viewer this looks incorrect. Riley’s responsibility in this play is the gap between the right tackle and the tight end, so he is executing this play correctly. Since Riley flows towards the weakside C-gap, other inside linebacker #52 Keenan Robinson (shaded in red) needs to fill in the gap as he watches the movement of the two-gapping defensive end #92 Chris Baker. Weakside outside linebacker #91 Ryan Kerrigan fights off the block of the tight end for the tackle at the line of scrimmage. Not really utilized in this run, but defensive tackle #97 Jason Hatcher rushes through the strongside C-gap while strongside outside linebacker #93 Trent Murphy plays the cutback lanes outside the D-gap of the tight end on the strongside of the offensive line. Here is an example of this defensive breaking down due to the coverage of cornerback #41 Will Blackmon. The defensive front seven can’t get any pressure on Jameis Winston who shows great pocket awareness moving behind his offensive line. Just like the previous example, the Redskins run a Cover 3 shell behind their front seven which is their most utilized coverage shell so far this season. A defensive front that can’t get pressure – a VERY common problem for the Redskins this season – combined with poor coverage on a great receiver is a big play waiting to happen. Tendencies: The Redskins typically use the 3-4 Under as their base defense when the offense has two wide receivers or less on the field, but not typically in goal line or in short yardage* situations. *Note: In short yardage situations, the Redskins like to run a hybrid mix of 4-3 Under principles and some 3-4 Eagle that deserve an article on its own. Maybe some day! When opposing offenses use 11-personnel – one running back, one tight end, three wide receivers – the Redskins typically respond with their 4-2-5 Over Cover 3 defense. In this defense, the Redskins like to play Jason Hatcher or Stephen Paea at strongside 3-tech, while playing Terrance Knighton or Chris Baker at weakside 1-tech. The outside linebackers get into three-point stances and rush the edges as defensive lineman. The strong safety (more on his role later) will play underneath zone coverage, while the Redskins drop their outside cornerbacks back with Dashon Goldson to form the Cover 3 shell. All of the players have one-gapping assignments. The goal of the defensive line is to penetrate into the backfield. Watch as Knighton and Hatcher both explode off of the line into their respective gaps. It’s a very aggressive defense at the point of attack, similar to the 3-4 Under like I explained above. Ryan Kerrigan (#91) rushes through the C-gap between the right tackle and the tight end while Trent Murphy #93 swim moves the left tackle completely out of the play making the tackle in the backfield. Off the screen in the image above is strong safety #24 Duke Ihenacho who sprints into the backfield to gang tackle the running back while Kerrigan stops any more forward progress. A well executed run stop. When the Redskins aren’t running a Cover 3 shell over their 3-4 Under or 4-2-5 Over defense, they tend to use a Cover 1 Man defensive shell. Although the result of the following play is a long touchdowns to the New York Giants’ wide receiver #82 Rueben Randle, Breeland actually has great coverage, but the ball slips by him for the score as he jumps in the air. Normally, Breeland has better ball skills and this would be a pass deflection on the quickly thrown go-route up the sideline instead of a touchdown. And an example without Duke Ihenacho. While these two plays are certainly cherry-picking extremes, they do illustrate the basic trend of the team and how mch of an impact the strong safety position has for the Redskins defense. So this begs the question: Why does the strong safety position matter so much in this defense? Under Joe Barry, the Redskins love to walk the strong safety into the box for run support as the “third” linebacker when the opposing team brings out three wide receiver sets. Ihenacho’s aggressiveness and willingness to play run defense solidified the front seven when they needed an extra defensive back on the field. Speaking of injuries, against the Patriots the Redskins were without starting nose tackle Terrance Knighton, which allowed Blount to gain 129 yards on the ground. Knighton who regularly takes on double teams for the defensive line was sorely missed. 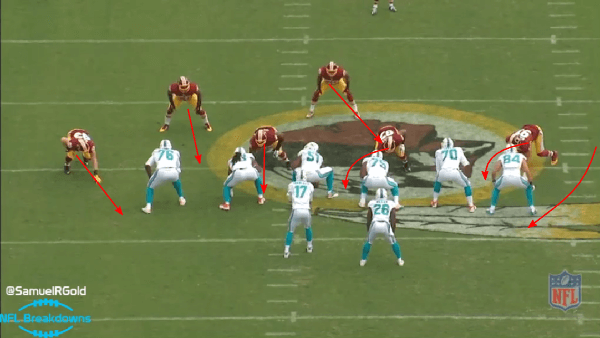 While Chris Baker helped in his relief, he mainly plays at the 2i/3-tech position for the Redskins defense. Backup nose tackle #64 Kedric Golston simply can’t maintain the same double teams for this team to make the unit effective in run stoppage. Right now, lack of sack production is what defines this defense. The Redskins actually did a great job of putting pressure on Tom Brady two weeks ago, but his quick release saved the future Hall-of-Famer from being sacked. Pressure is important, but a sack is much valuable and the Redskins are in 26th overall in this category. Where do the Redskins get pressure? The Redskins most important pass rusher positions are the weakside outside linebacker and the 5-tech strongside defensive end. These spots are manned by Ryan Kerrigan and Jason Hatcher, respectively. Ryan Kerrigan has 4.5 sacks so far on the season, while Jason Hatcher needs to be more consistent off of the line of scrimmage. Against the Carolina Panthers, Hatcher got into the backfield twice easily which both should have been sacks, however, neither of them were converted by him. This has been a problem all season as both Kerrigan and Hatcher regularly get pressure on the quarterback, but for some reason can’t finish. Follow Samuel Gold on Twitter: @SamuelRGold.